Ladies and Gentlemen, Mermaids (and Mermen) do exist, and I found them in Raja Ampat, for real!! First of all, the coastal topography and its geographical location make the weather in Raja Ampat rather unpredictable. One moment, it could be dazzlingly hot, but another second, it could be pouring heavily like on the first afternoon, the day we arrived. Or curious still, is the local rain as you can see in the photo below. But lucky us, the weather after that heavy downpour just got better, so we were able to island-hop conveniently and safely. Although occasionally in the evening, it drizzled a bit. So the first stop on our itinerary was Teluk Kabui, a small bay situated between Waigeo and Gam islands. Getting there from our resort was quite quick and we knew we were there when we started seeing boulder formation with trees growing from it, as The Lonely Planet puts it 'jungle-topped limestone islets'. The islets were of curious shapes, some like tops, balancing precariously on a thin base, which the salty sea water and weather erode over time. It took us quite a lot of effort getting up to one of the islets, with steep and unsteady soil slopes and virtually nothing to hold on to. But the view from the top, this, was a worthy reward. The next day on our island hopping tour, our first stop was Sawinggrai Village. Apart from the clear shallow water with coral reefs-studded shore, what's more memorable about this place is the people and the kids! A bunch of enthusiastic little children, who were innocently curious with the toys (drone) that we brought for documentation. We also got to feed the fish here, which turns out to love dough (flour and water mixture)! There's a homestay here, so it could be one of your options if you wish to stay with the locals and experience how their easygoing daily lives go about. Then something in the water got the children fixated..
Next stop, Pianemo, an islet that provides one of the most tourist-captured sights. To get to the top, one has to climb up the 120-ish wooden stairs. Yep, again the effort was great, but the view and the heat at the top was unparalleled. Despite the heat, I didn't want to leave immediately, I just wanted to soak up as much of that view as possible! With this kind of view, would you even want to leave? Be careful when you're here because the danger of dehydration and even heat stroke is very real. So bring your sunnies all the time, apply the strongest sun screen that you can find with SPF 50 or even more, wear a hat if possible and have a water bottle ready in hand always! Close to Pianemo, there's a Homestay, where we went to, to have lunch. The Homestay's location is ushered on one side by the by and the other side already open seas. 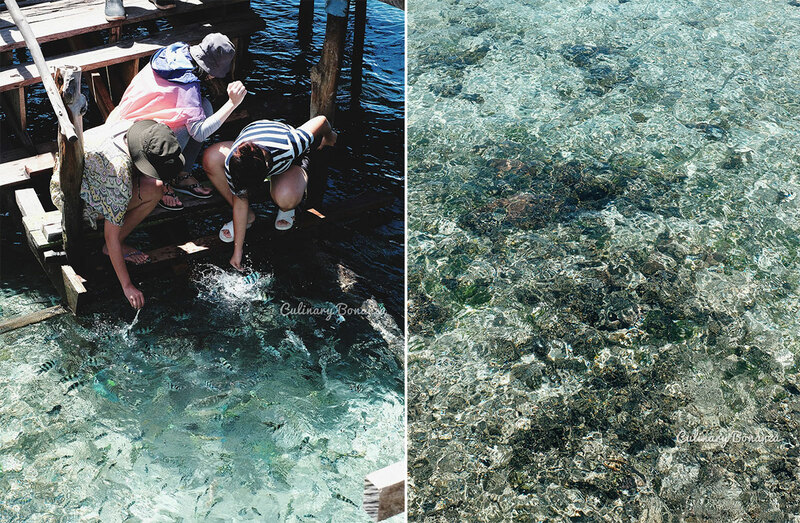 At Arborek Village, I took my very first dip in Raja Ampat's water and the experience was simply surreal. It was my very first snorkeling experience ever and I was quite gutless to swim without a life vest like most of the others in our group. Well although not as adept swimmer as our mermaids are, I managed to stay afloat and could breathe through the snorkel to soak up the surreal view underwater. One of the clearer shots I managed to get underwater. 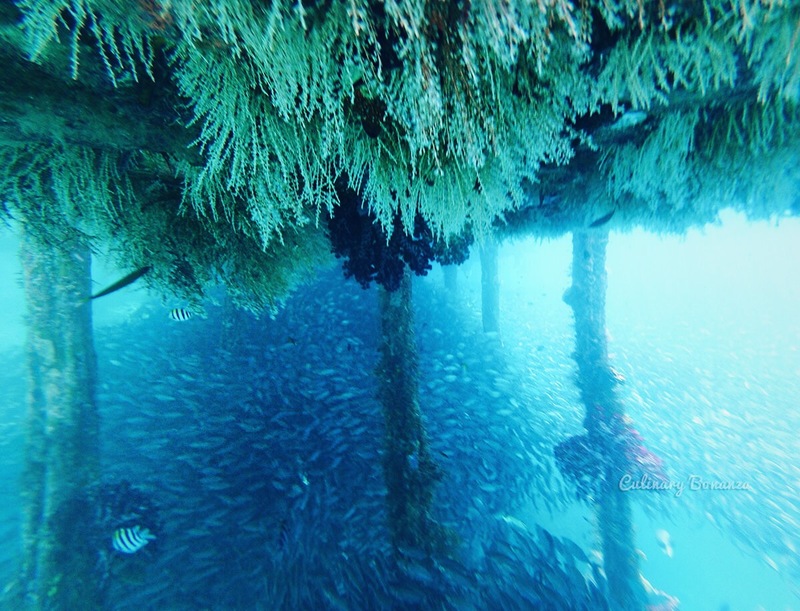 Aren't you intimidated by the sheer number of fish there? Yenbuba village was another spot that we visited. I remember it because it has a very long floating deck (see below photo), as well as a spot where I took a repeated jump off the deck just so I can get a video of myself jumping into water. I wish I could do somersault in the air like the local boys could. Ah, at least, I had the guts to jump LOL! 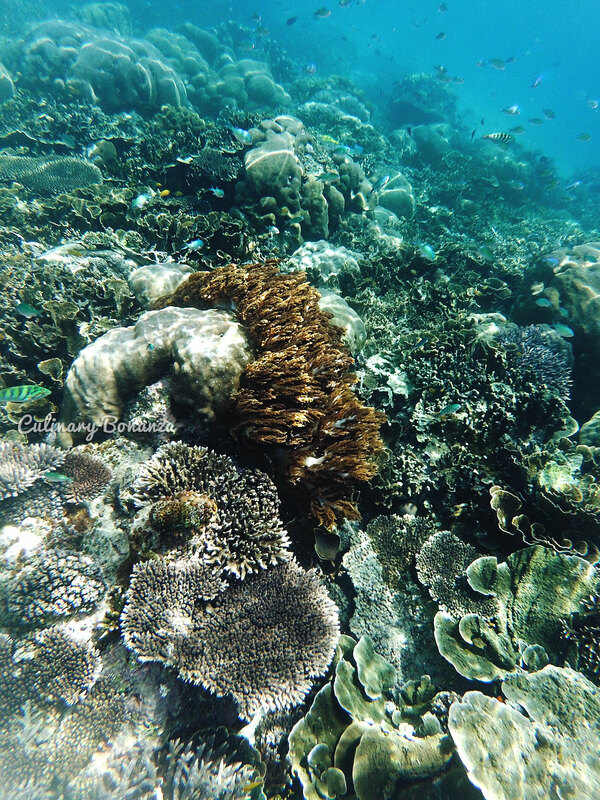 This site is also another unique, must-visit natural attraction in Raja Ampat, which is located right smack in the middle of the sea. The sandbank is at its biggest during low tide, so it's actually quite difficult for our boat to reach. So we had to walk from the coral-studded shallow water towards the sandy bank. There was no vegetation at all, so if you intend to stay here for quite a while, it would be wise to bring an umbrella or anything to cower under. The sun, I can't emphasize more, is merciless! It's best to wear slippers when crossing the water to the sand bank, because the coral reefs are very sharp and will otherwise graze and cut your legs, if without. This was our last beach / islet spot of #MannaEncounterRajaAmpat tour. As we were all tired from playing in the water at Yenbuba and Pasir Timbul earlier. It's a shaded shore with a large tree and there's even a swing hanging from one of the trunks. Lovely place to just chill under the shade and enjoy the breeze. And that was the end of our journey in Raja Ampat! The next day, we took the boat back to Sorong and spent an evening there. The city is still a sleepy and developing coastal city, there are a few supermarkets, shophouses, canteens, schools, hotels, etc. But they were all pretty basic, we're lucky to have wi-fi connection in the hotel, although it's quite slow. Craving for some coffee, I asked my friend who's living in Sorong to take me around to find some souvenir and a decent place for coffee. The only place selling Papuan souvenir is just like a small 'warung', and the goods are quite expensive, which I guess is fair, because they must have traveled far from the source to get to the city, and the materials are all real feather / claws / etc. Let's just say I'm not keen on collecting preserved animal parts *shudders and thus, I'd rather buy a coconut shell bowl that I found at Misool for IDR 50,000. Again, not cheap for coconut shell, but oh well, at least I have something to bring home as a souvenir for myself. The name 'Manna' was inspired from the history in the Holy Bible and the Quran. It was the food that God provided from the sky for the Israelis, during their journey to cross the dessert. 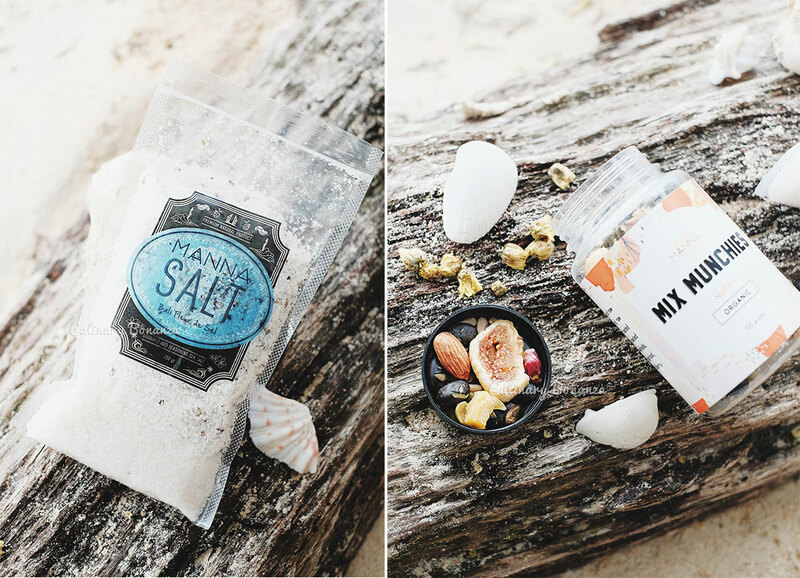 Manna Indonesia was established in 2015 with a vision to professionally manage premium natural Indonesian products, such as bird's nest, hand-harvested fleur de sel (sea salt), premium flower tea and more products to be added in their portfolio soon. Fascinating and beautiful. Thanks so much for your posts. It must've been a memorable one for you. Nice shots!